The Ottawa 67’s are back on the road this weekend as the club kicks off its second run of back-to-back-to-back game in as many weekends. 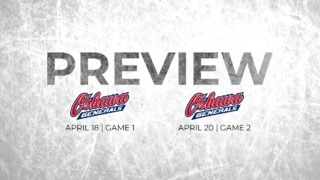 After going 1-2 last weekend through two games on the road with a home date sandwiched in the middle, the 67’s will once again look to tighten up defensively when they visit Guelph, Owen Sound and Mississauga on Friday, Saturday and Sunday, respectively. On paper, the 67’s should be able to pick up important wins on this trip. Both Owen Sound (7th) and Guelph (9th) sit in the bottom half of the OHL’s Western Conference standings while Mississauga sits sixth in the East, just two points up on the 67’s in ninth. The 67’s have also played better on the road early in the season, something for which there is no easy explanation. “We’ve been a good road team for the most part this year,” said Associate Coach Mike Eastwood. “It’s not typical to be better on the road, especially in this league. It’s just about simplifying our games… we’ve got to play the right way. Working on home success can take a back seat this weekend however, with the 67’s once again on the road. Forward Drake Rymsha, who has nine goals and 16 points in 18 games this season, said his team has to do a better job paying attention to the small details. Offensively the 67’s added some help to the lineup on Thursday with the acquisition of 18-year-old centre Tye Felhaber from the Saginaw Spirit. The Pembroke native has notched 83 points in the last two season in the OHL. The club will also get some youthful reinforcements back on the blue line for this weekend’s trip as defencemen Kevin Bahl and Carter Robertson have returned from the World Under-17 Hockey Challenge in Sault Ste. Marie. Peter Stratis is also back from the tournament, but is about a week away from returning from injury. 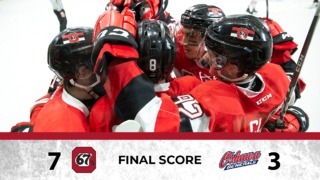 After closing out this weekend’s road trip, the 67’s will be back in action in Ottawa on November 16 for the annual School Day Game at Canadian Tire Centre against Peterborough at 10:30 a.m. with over 12,000 excited students in attendance to help power the 67’s to victory over their division rivals. 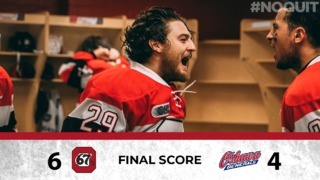 The 67’s are back at TD Place on Friday, November 25 when they host Logan Brown and the Windsor Spitfires at 7 p.m.